A couple of weeks ago we got the chance to catch up with The Wild Swimming Brothers, Jack, Calum & Robbie to chat about their most recent challenge, ‘Into the Maelstrom’. The ‘Into the Maelstrom’ challenge is a world first attempt to swim across the two biggest and most powerful whirlpools in the world, the mighty Moskstraumen and Saltstraumen in Norway. Now back on land, we caught up with the Hudson brothers to hear about their latest challenge. After 6 months preparation, ice baths, cold showers and maelstrom research on Monday 22nd August we finally set out to swim across the Saltstraumen, the fastest tidal current in the world, 2 days later we’d be setting out to swim across the Moskstraumen, completing the first ever swims of the 2 biggest whirlpools in the world. The day before we had seen the Saltstraumen at full force, a colossal whirlpool appearing and disappearing with alarming unpredictability, it’s central vortex swallowing at least 2 metres down into abyss. We’d be swimming across the 225m straight at a slack tide and our ship captain Knut Westvig of Stella Polaris used his years of experience to calculate that we had roughly a 12 minute window to make the crossing before the tides changed and the full vortex appeared. Staring at that whirlpool I thought to myself why was I here? Why was I putting myself and my brothers into harms way? The reason is simple, as brothers we’ve spent our lives outside exploring the rivers, lakes and forests of our childhood Lake District, England and Scotland. As we’ve grown older we’ve swam in beautiful and stunning locations all over the world, from India to Guatemala and Syria to Indonesia and shared the water with all manner of fascinating and beautiful creatures. Over the years we’ve watched as people have grown more disconnected from the natural world, more removed from the elements around them and disaffected by the pressing environmental issues of our age and that’s something we want to change. We felt that the Maelstrom was the perfect personification of mother nature at her most ferocious and beautiful, a central force concentrating plankton and krill in a feeding grounds for all manner of wildlife and the ideal manifestation of the wild left in the world. After visiting Norway in June we learned of the Norwegian Governments plans to drill for oil in Lofoten and immediately knew it was our duty to raise awareness and speak out against this. Who are we to have an opinion? Well we believe that every single one of us has an equal role to play in protecting our planet for future generations and every voice is as valid and powerful as the next. I’m very happy to say that at 6.35pm Monday 22nd we became the first people ever to swim across the Saltstraumen, the 2nd biggest whirlpool in the world. The margin between success and the abyss turned out to be less than 45 seconds with the current turning in a second and the central whirlpool appearing just as we clambered back into the boat. Setting out from the South side we crossed the first stretch with relative ease but on the final stretch the currents swirled and threatened to drag us below the bridge and into the larger vortexes below, as Jack and Calum made it to the rocks we turned around to see big brother Robbie battling hard against the currents making the rocks just in time. After a quick hug Knut our captain called us frantically back to the back and as we swam out and clambered aboard the currents turned, spinning the boat in a full circle. Despite the danger it was no accident that we made it just in time, with months of meticulous planning, the most experienced ship captain in the area and a dedicated support team of Beth Harrison, James Silson, Dave Renton and Luke Palmer we were set up to succeed. Swimming side by side as brothers through the vortex is an experience we’ll never forget and there is nowhere we’ve swam that was more beautiful, frightening and humbling at the same time… that is until two days later when we’d swim the Moskenstraumen. After a days rest we journeyed to Moskenes, spending the night in Reine and meeting Lars and Therese from Aqualofoten to plan our 8km swim from the island of Mosken across the maelstrom to Helle at the tip of Lofotodden. 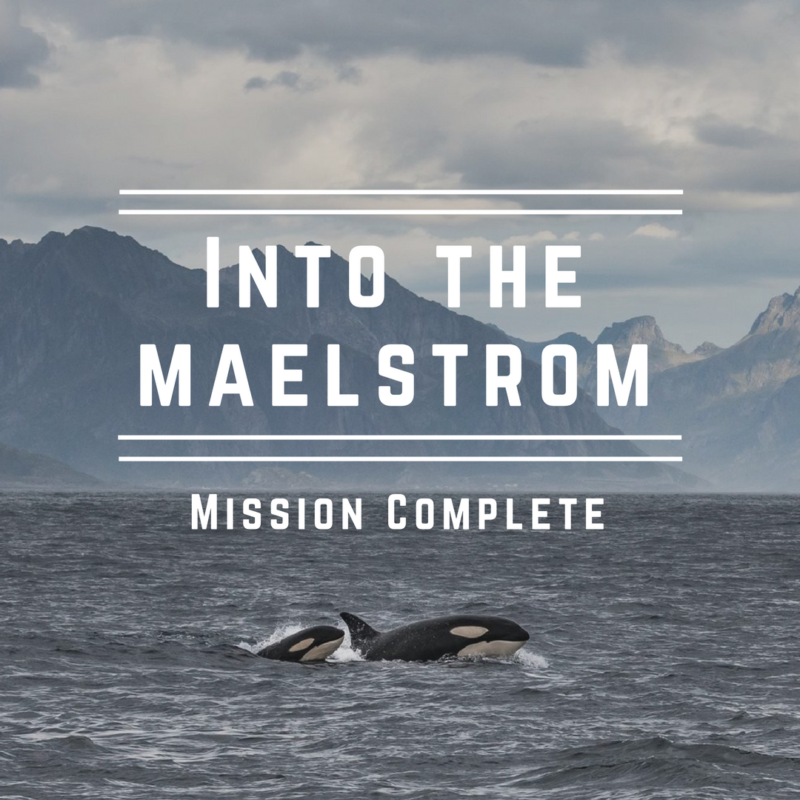 The icy cold water of the Arctic, blooms of Lions Mane Jellyfish and the presence of Orcas made for a psychologically challenging swim and the idea of swimming through the maelstrom to Helle meant our brotherhood would need to be at it’s strongest. 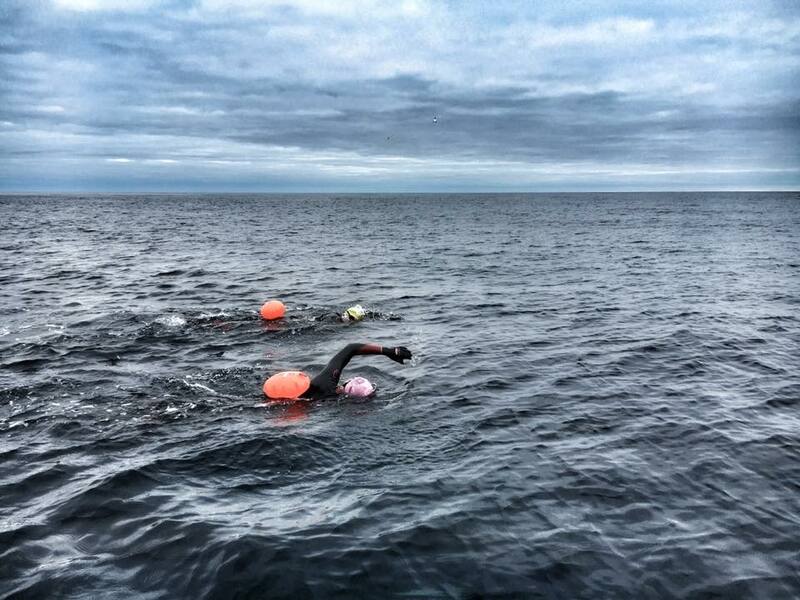 We set off at 8.00am and at 10.31am we became the first people ever to swimacross the Moskenstraumen. Pods of Killer Whales had been seen in the maelstrom as early as 4 days before and this was an ever present fear, despite posing little threat to humans, the constant thought of a 6 ton bus sized black shadow of an adult bull Orca appearing beneath us was psychologically challenging to say the least. But with the Norwegian weather gods looking on favourably we crossed the 8km stretch of water together as brothers. It was the most incredible experience of my life, looking up to my left and seeing my little brother Jack dwarfed by the cold black expanse of the sea and the distant colossal mountains of Norway’s rugged coast and breathing to my right and seeing giant Lion’s Mane Jellyfish floating below Robbie as Sea Eagles patrolled the islands and shoals of fish swam beneath us. I felt that we’d tapped into something primal, truly experiencing one of the wildest corners of the world on it’s own terms, through wild swimming we’d directly immersed ourselves within the environment and seemed to merge into the sea as we swam onwards. Beaching onto the rocks we found time for a quick hug and scrambled back to the boat with Calum showing early signs of hypothermia, with his hands shaking so much he threw a cup of coffee all over the boat, there was no time for photos or celebration, the Moskenstraumen had pushed us to our limit. 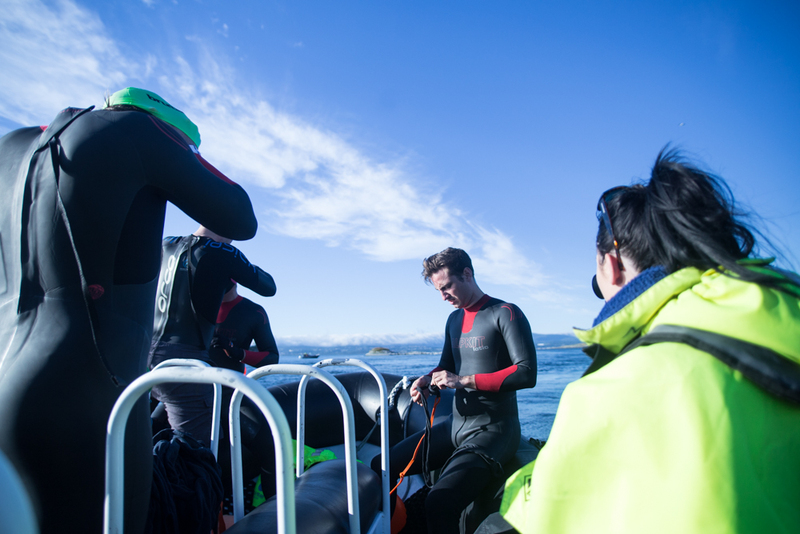 Two and a half hours is a long time to spend in the water of the Arctic Circle! We were humbled by the sheer power of both maelstroms, but this was never about beating or conquering the elements it was about seeing whether mother nature would let us pass and be part of her ferocious and beautiful world for a short time. We’re here to protect this environment and the animals who call it there home and raise awareness about the threat to this ecosystem. This is the most beautiful place we’ve ever swum and it is madness that the Norwegian Government is planning to drill for oil here. Alongside WWF Norway we advocate a complete ban of all oil drilling activity in the Lofoten islands and hope that the image of three brothers taking on mother nature’s most fearsome creation will inspire you to stand up and protect the animals and ecosystems with whom we share the planet. Since finishing the swims we’ve found some time to enjoy Norway with our team of Beth, Dave, James and Luke. We’ll be resting up for now but if you’d like to get in touch about press/articles/interviews to spread the message about protecting Lofoten then get in touch. Follow the boys journey on their Facebook, Twitter or Instagram. If you want to donate to the boys challenge and help the WWF, you can donate to their cause here.